Updated Wednesday May 30, 2018 by CYLA. Sticklettes - Girls in grades K-2. Practices will begin in late March with games beginning around the beginning of May. Games may be played at home or at any designated Sticklette field within Anne Arundel County. Games are officiated by the coaches with (2) 20-minute halves. The format is 6v6 on a 50-yard field (midline is the restraining line) with 2 defenders, 2 midfielders and 2 attackers. Two players must stay behind the restraining line at all times. No goalie or shooting net is used. All free positions are indirect and there must be at least one pass made after any whistle before a shot may be taken. Checking is not allowed nor is double teaming. No score is kept at this level as the emphasis is on learning the fundamentals of the game and having fun. The focal points of this league will be skill-building and sportsmanship, with some emphasis on the basics of positioning, rules and field play. Pee Wees - Girls in 3rd and 4th grades. The format is 8v8 on a 50-yard field with 7 field players plus a goalie. Field player setup is 2 defenders, 3 midfielders and 2 attackers. Draws are used to start the game and to restart after every goal. The rules are similar to Sticklettes. Three-Seconds in the 8m is not called but Shooting Space is definitely enforced to keep the girls safe. Games are officiated by referees that have been trained and certified. No checking or double teaming is allowed. The “3-Seconds Closely Guarded” rule is enforced (see below). All teams will be scheduled 12 games that will consist of (2) 20-minute halves each. No score is kept as the emphasis is on learning the fundamentals of the game and not on winning. The county guarantees a minimum of 9 games so weather related cancellations will only be rescheduled if your team falls below the 9 game minimum. 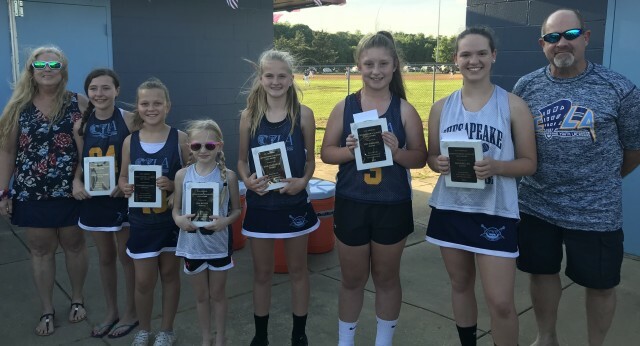 Middies - Girls in 5th and 6th grades. They play on a full 100-yard field with 11 field players and 1 goalie. Rec & Parks requires that teams are designated as A, B, or C level. Only 7 offensive players are allowed over the restraining line at any time. Games are played with (2) 25-minute halves and an 8-minute halftime. Modified checking (the entire stick of the ball carrier must be below her shoulder) is allowed. The “3-Seconds Closely Guarded” rule is enforced. Score is kept and reported to the county. Twelve regulation games will be scheduled with an 8 game minimum guaranteed by the county. Juniors - Girls in 7th and 8th grades and is played by high school rules in a more competitive environment. Full checking is permitted but carefully regulated by the officials for the safety of the players. Score is kept and reported to the county. Games are played almost exclusively on high school turf fields within the county. Ten games will be scheduled and will consist of (2) 25-minute halves with an 8-minute halftime. Playoffs will determine the Junior A, B and C championship teams. We will hold evaluations for the MIDDIES and JUNIORS divisions the dates, times, and locations TBD, so they may be placed on A, B or C level teams determined by the coaches.